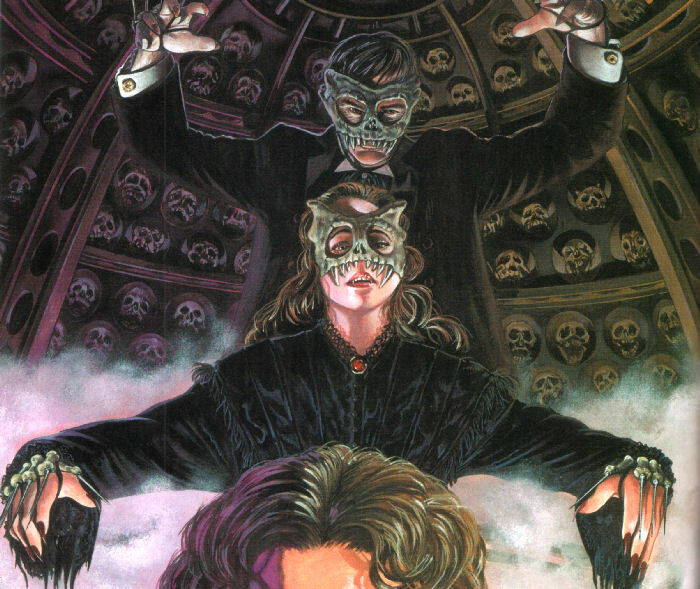 History: Allegedly founded by Grandfather Paradox, a Time Lord criminal who cut off his own arm to escape his imprisonment, the Faction Paradox exist to break the rules the other "Great Houses" (various groups with time-travel capability). The Faction lives for ritual: each member rises through the organisation by killing a selection of their own ancestors in a prescribed order and manner, thus breaking their connection to history (but if they screw the order up, they can wipe themselves from existence). Hidden behind masks of bone, each member of the Faction is armed with a weapon attached to their shadow - the real world equivalent is not visible, but that makes the shadow version no less deadly. The Faction's base is London, during the eleven days struck from the calender in 1752 when England finally joined the rest of Europe in using the Gregorian calender (see comments). Throughout its existence (history would be an incorrect word for a group such as they) the Faction has been intermittently at war with various groups, and has even been wiped out of existence on at least two occasions. However, for a group which delights in paradox, even being retroactively removed from the timelines so that they were never created isn't a permanent setback. Comments: Created by Lawrence Miles. The Eleven Day Empire: Why was there a change in calender in England in 1752? The original (Julian) calender was devised by Julius Caesar in 46 B.C., based on a day of 365.25 days (hence having an extra day, February 29th, every four years) - however the astronomical year is actually closer to 365.242 days, or 11 minutes and 14 seconds of a discrepancy each year. This tiny amount added up, so that after 128 years, the calender was out by a full day. By 1582 the Julian calender was out by around 10 days. Pope Gregory III, noting that this was throwing off the dates of Easter, tried to set things right by ordering a change - ten days were skipped and the leap year was to be dropped every 400 years (he also shifted New Year's Day from March 25th to January 1st). England was by this era no longer a Catholic country, and so refused to accept the Gregorian calender. Over the next 170 years England (and later America) gradually began to use both calenders (which meant that documentation of the time can be confusing as to the dates of things, especially as this meant that January, February and most of March could be in either one of two years, depending on when you took New Year to be). In 1752 England finally dropped the Julian calender, eliminating the now 11 day discrepancy by going straight from September 2nd (Julian) to September 14th (Gregorian). There were riots in some quarters as people felt they had been robbed of 11 days of their lives; and it is in this conceptual missing eleven days that the Faction Paradox set up shop.